Beat the eggs and buttermilk together in a mixing bowl until smooth. Mix in the chicken wings, cover, and refrigerate 30 minutes. Combine the flour and crushed crackers with the pepper, thyme, cayenne pepper, salt, and garlic powder in a large mixing bowl. Remove the chicken wings from the buttermilk marinade, and discard the remaining marinade. Allow the excess buttermilk to drip from the wings, then press into the bread crumbs to coat. 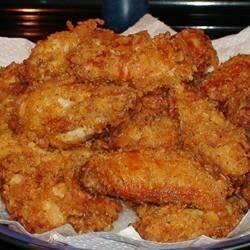 Cook in batches in the preheated deep-fryer until the breading is golden brown on the outside, and the chicken wings are no longer pink at the bone, about 10 minutes per batch. Drain on a paper towel-lined plate, and season to taste with salt before serving. For buffalo wings, same procedure as above only immediately after removing from oil, place in large sealable container with wing sauce and shake to coat wings. they werent bad but they weren't great. The breading was bland. I would use more spices next time. Frickin legit. Used this with different spicy and BBQ sauces. 5+ stars. The wings were good, but a little bland. I think next time I will add more seasoning! Very crispy and tasty. I don't like too much spice and this was very nice. Tasted even better with chicken and rib BBQ sauce. Will definitely make again.